My hope for this deck was to print it in as luxurious a fashion as it was painted. That means a huge amount to raise with one Kickstarter, so I'm trying to spread out the cost through these preliminary poster Kickstarters. So far though, I'm not sure if it's gonna happen! Especially because the $2000 funding goal includes shipping (which I didn't realize until now). I'll only be able to put half that towards the end tarot deck, I think. Anyway, it's only been the first day, but I need steam to keep this thing going! I am truly wishing you success on your initial kickstarter. I wish I could help or even make a suggestion. All I know is that if this deck doesn't materialize; I'll be sorely disappointed... I can already see some of my tax return being squirrled away for next fall.
. You could be worrying too much here in my opinion. The posters or extra goodies could simply be added to make different package deals in the fall. I REALLY want it and I'll be very upset if it doesn't materialise. I want it so much in fact I want 2 copies! Like I said before, just concentrate on creating and stick to your original inspiration. In my opinion, the best thing you have done to promote your deck was standing up to the criticism you received on here. You not only showed intelligence but maturity, two qualities I suspect a few people didn't think went hand in hand with your art. That's where your art promotion needed to be. Ok.... I found where you have the thought process of your card depictions - and in the future I'll read it Before making remarks....lol. Seems like you already had my 9 of Swords concerned covered. Meanwhile, I'd like to add (to your credit), that you're DOING this the way I wish K. Krans had done the Wild Unknown (another deck I'm in love with). Her deck just "appeared" with very little to say about it....all of us have been providing our own rationale as to why the cards are the way they are. Anyway, no matter what happens.... keep the card painting up. If kickstarter doesn't get you through, something will come along just don't give up on this; you've got a great thing going here. Haha, no harm done! I don't mind explaining my interpretations, it's no big deal. If Krans did her deck the "wrong way" and still had such a huge success, I gotta know how she went about it! I've contacted a few tarot artists and they seem fairly hesitant to help me out, probably out of the perception that I'm a competitor. Also, Kickstarting is a hopeful at the moment. It'll be difficult to get all those funds, so I'm planning on fronting at least $5k of my own money to get it done, but I'm still not sure. I've always been very conservative in my estimates though, so fingers crossed! I only just found out about this deck. I think it is gorgeous! I really like it. It looks classy. I like how you have blended the black&white with gold, silver, or red elements. Making it just a bit different. I really hope you will complete this deck. Because I would buy it in a heartbeat! He needs our help to back the poster projects that will result in the deck. Not much more to go now (last I saw there was just over $100 USD to hit goal). The logic is that the production cost for this deck is a lot higher than most decks that have been produced. Putting all of that cost into one Kickstarter is quite a gamble, and it may never get funded. If I can distribute the cost over other products (like these posters), I can make the final deck Kickstarter a smaller goal and more likely to actually get funded. I'm also planning on investing my own $5k into the production cost beforehand so there is even less funding required by the final Kickstarter. The best case scenario would be to get the final Kickstarter's goal to about $12-15k, simply because it's a number that I've seen hit before and has a higher probability of being funded than something like $25k. With that said, I can't fault someone for not wanting to buy these posters, or support a deck that only exists in 12%. There's simply other things to be spending money on, and that's understandable. There are other things, yes. But I think if people avoid buy a few more $1 apps they can find the funds quite easily. I'm glad to see there's only a paltry $32 to go. 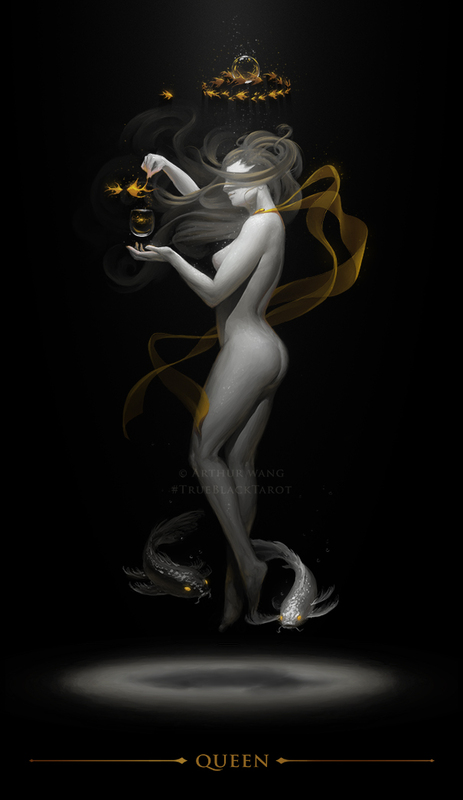 I recently finished the Knight of Wands and updated the Queen of Cups, as I felt she wasn't looking regal enough for a queen. Just a bit of flowing fabric around her, which I think accentuates both the sensual nature of her posture and the luxe of her queen status. 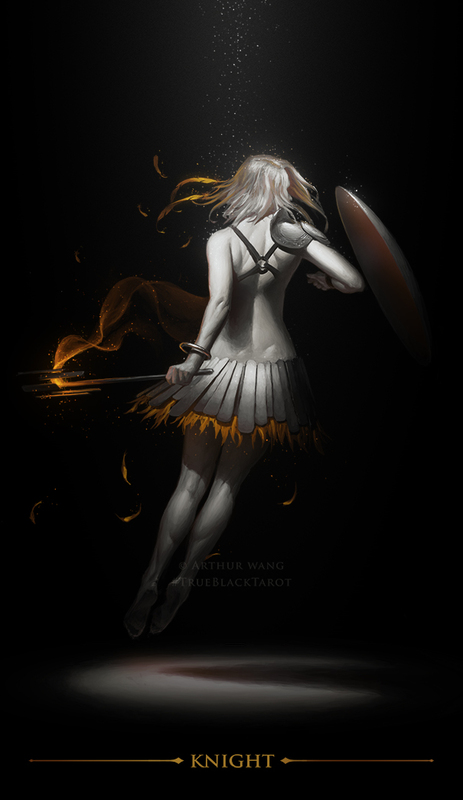 The Knight of Wands, a being of passion, drive, and a dash of recklessness. While we traditionally associate knights with weapons, this one is seen charging in with a blunt shield, headstrong and in force. Her fierce drive heats the wand in her other hand, imbued with the elemental fire of her suit, while feathers trail off her hair and armor, indicative of this one's penchant for glamour and showmanship. Of all the knights, this one's armor is the lightest. This makes her ready to move in an instant, but is also the least protective. It offers a word of caution that excessive amounts of bravery mixed with minimal planning can be dangerous. He who always succeeds does not know the pain of failure, and this cockiness can result in trouble. Today I've got the Queen of Swords, finally a good match for my very first painting. 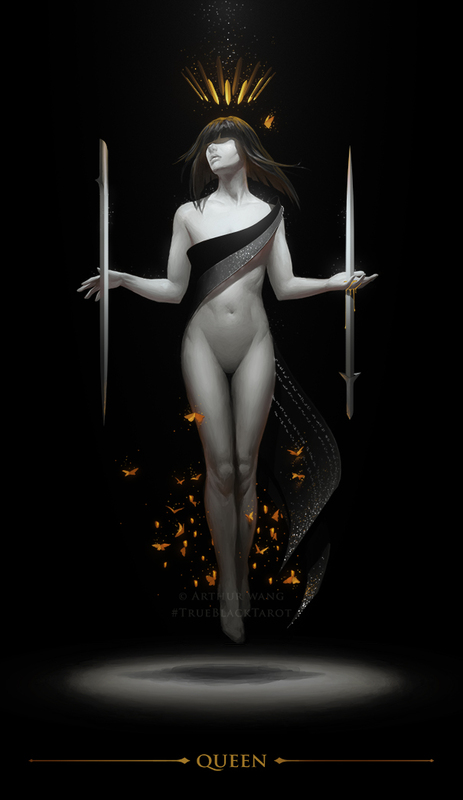 Her two swords represent her honesty and willingness to play by the rules: sometimes the house rules in your favor, and other times against you. To be entirely fair and transparent, we must accept both positive and negative outcomes as we deserve them. Her knowledge and wit are also embodied by the glowing inscriptions that peek through her drapery. This is an intelligent Queen, understanding vast libraries of knowledge from the factual and empirical to the worldly and behavioral, though she needn't flaunt her intellect openly for all to see. Lastly, this Queen continues the butterfly motif of her partner, again signifying her penchant for the world of immaterial knowledge, though she inherits his crown as well. This knowledge can be beneficial, but use caution in its presentation. Sometimes the truth can hurt.